Over the past 50 years, the Green Revolution in India has ushered in new technologies that enhanced the productivity of staple grains and transformed the country’s agricultural landscape. As diverse farmlands were converted to monoculture fields of wheat, maize and rice, land dedicated to micronutrient-rich food crops diminished. While this transformation has helped to alleviate hunger, much of the rural population suffers from micronutrient deficiencies, or what is often referred to as hidden hunger. These deficiencies have resulted in a high incidence of childhood stunting and wasting as well as anemia in both women and children, which threaten the long-term health and development of India’s rural population. To tackle hidden hunger and boost the nutrition profile of agriculture in India, the TCI has been awarded a US $13.4 million grant from the Bill & Melinda Gates Foundation. With this new investment, the TCI will promote a nutrition-sensitive food system in India that enhances the rural poor’s year-round access to more affordable, diverse and quality foods. This will be achieved through the integration of nutrition-focused objectives, actions and metrics into ongoing and future agricultural projects and programs, primarily in the States of Bihar, Odisha and Uttar Pradesh, as well as the potential scaling up of these initiatives. 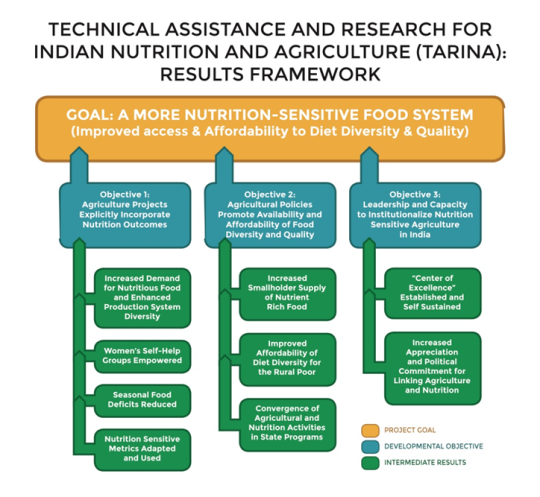 The four-year grant establishes Technical Assistance and Research for Indian Nutrition and Agriculture (TARINA), a consortium that connects multi-disciplinary and policy-focused academics with scale, quality and impact-focused Indian implementation partners and policy influencers. Led by TCI, the TARINA Consortium links the evidence-generating capacities of the International Food Policy Research Institute (IFPRI), the Tata Institute of Social Sciences (TISS), Emory and Cornell Universities with the implementation and technical capacities of leading NGO partners – BAIF Development Research Foundation, CARE India and Grameen Development Services (GDS). The TARINA project was launched on 1st of December 2015 and will run through November 2019. Provide technical assistance in redesigning agricultural projects to ensure nutrition outcomes at scale. Provide assistance and evidence for policy reform that enhances diet quality at affordable prices. Build capacity to design and implement nutrition-sensitive agricultural programs and policies. From the 14th-16th of December 2015, the TARINA Consortium met for the first time in New Delhi to agree on research and activities that will be carried out under the project’s three main objectives, and the next steps for establishing an M&E framework. With regard to the first objective, the consortium discussed where TARINA could be integrated into ongoing activities of projects and programs implemented by BAIF in Bihar, CARE in Odisha and GDS in Uttar Pradesh. Several areas of intervention were identified for each state, including a set of interventions that are common across all three states and that have the potential to be scaled up. These include the promotion and development of: pulse production, labor-saving technologies for women, dairy value chains, kitchen gardens and small ruminants. NGO partners agreed to begin preparatory work and planning around these common areas of intervention by organizing and mobilizing community groups and institutions. In a discussion regarding TARINA’s second objective, the consortium agreed to prioritize research initiatives according to their: (1) policy relevance and traction, (2) nutritional impact and (3) feasibility. Based on these criteria, the consortium decided to focus on the following research topics: diversification in agricultural production; the nutrition dimension of integrated value chains; managing price shocks; the nutrition dimension of agricultural research and extension; improving the availability of more nutritious foods; and policy convergence across nutrition, health and agricultural programs. Similarly, in a discussion regarding the project’s third objective, the consortium agreed to focus on a core set of action items. These include the initiation of policy dialogue; communication and outreach; building the capacities of implementation and policy partners; consolidating and collating existing research; and establishing a Center of Excellence (CoE) in New Delhi that will help implement these activities and offer products and services which support the project’s overall goal, including the provision of new evidence and research where needed. The CoE will also work to generate demand for its products and services to ensure its sustainability beyond the life of the four-year grant. Prior to establishing an M&E framework for TARINA, the consortium will conduct a diagnostic survey to gain a better understanding of the challenges and constraints affecting food and nutrition outcomes in each project location. The survey is a rapid assessment that will rely on existing data and information as well as interviews with community groups and local stakeholders. It is intended to deepen the consortium’s knowledge about ongoing projects and programs implemented by NGO partners and the general context in each state. Results from the diagnostic study will help to narrow interventions that will be implemented in each project location under objective one, and to refine research initiatives prioritized under objectives two and three. They will also be used to identify indicators for monitoring and evaluating the impact of project interventions over time. A team of TCI researchers will join NGO partners in their respective project locations to complete the diagnostic survey from February to March 2016. The TARINA Consortium will then reconvene in late March to finalize a work plan for years one and two of the project and to decide on the metrics for the M&E framework based on the results of the survey.